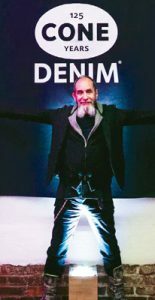 Francois Girbaud, founder and owner of Marithé + Francois Girbaud, attended the two-day Cone Denim event and was a juror for the student runway competition. Cone Denim recently held a two-day celebration in Greensboro, N.C., to commemorate the company’s 125th anniversary. The celebration included tours of the historic White Oak™ mill, a party at the Revolution Mill Event Center — a space converted from Cone’s original mill — and a design challenge and runway competition for students from North Carolina State University’s College of Textiles. The students used selvage denim from White Oak to create fashion items that featured in the runway show. Attendees included top denim brands and designers, as well as a variety of industry icons who acted as jurors for the runway show. In addition, Greensboro Mayor Nancy Vaughan named April 6 Cone Denim Day in Greensboro.